Look for Notre Dame-Fairfield senior forward Dylan Wade to be a key scoring threat for the Lancers this season. FAIRFIELD - Last season, for the first time since 2013, the Notre Dame-Fairfield boys’ soccer team failed to make the Class S tournament. Needless to say, that probably didn’t sit well with any of the underclassmen, who had to sit and watch the playoffs from the stands. This season, with a roster loaded with experience, the Lancers are ready to make the move back to the postseason. Quad captains Sean Buzzee, Marcelo DeSouza (All-SWC Patriot Division), Kevin Moratoya and Connor Steer (All-SWC honorable mention), will lead a group of nine seniors that will look to improve on last fall’s 5-11-1 record. Julian Barrantes, Eason Long, Carlos Lopez, Mike Mizak and Dylan Wade are the other seniors. The Lancers lost four one-goal games last year, something that has to change if ND wants to challenge for the South-West Conference title. “Knowing that the players will work and play hard as a team will help us go far this season,” wrote Budreckas. The bitter taste in the mouths of the Jesuits players that saw their season come to a crashing end in the opening round of the Class LL playoffs last fall, is probably still there. And why not? After posting a 12-win season - including the 100th win of head coach Ryan Lyddy’s career - winning the SCC Hammonsett Division (7-0-1) and reaching the SCC tournament championship, Prep’s dreams of a state title were dashed in the first round with a 4-3 loss to Pomperaug. But with a roster full of returning starters, the Jesuits are prepared to battle once again for the SCC championship and a deep run in the CIAC tournament. Alex Whammond -- an All-SCC First Team selection last season that led the Jesuits with 25 goals and three assists - returns at forward, as does All-SCC Hammonsett Division player James Finnerty on defense. Senior midfielder Ross Keblish (three goals), senior forward Luke Finnigan and junior forward Andrew Newmeyer also are back. The goalkeeper position will likely go to junior Ryan Cowles with sophomore Will Hansen and freshman Conner Mahoney both pressing for playing time. It was a fantastic start for the Falcons last fall, and a floundering finish. Thanks to an 11-game unbeaten streak, Ludlowe finished the regular season with just one loss, going 9-1-6. 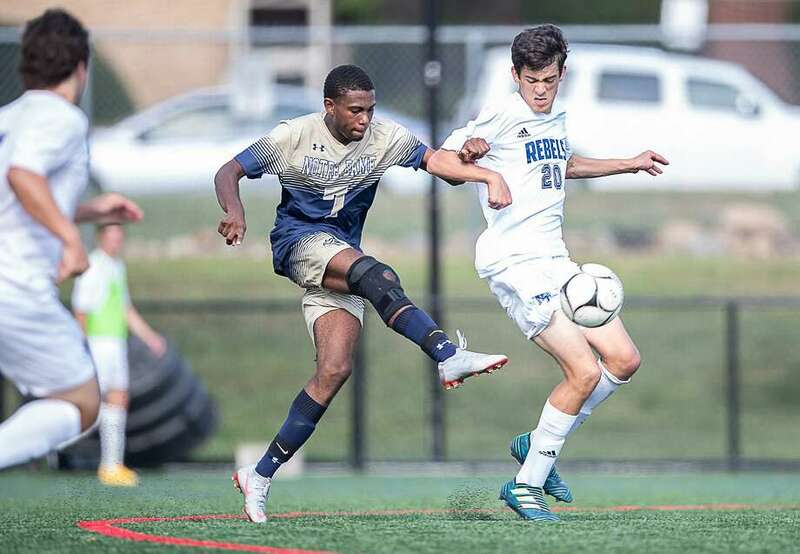 But a FCIAC quarterfinal tournament loss and another defeat in the Class LL first round, left a sour taste in everyone’s mouths, including head coach Kevin O’Hara. And heading into 2018, Ludlowe wants nothing better than to get rid of that bad taste. That leadership will come from goalkeeper Nicholas Teneiro, forwards Zaid Atta and Amar Sumra, midfielders Calum Crawford, Matt Rullo, Patrick Kilbride, Kristo Boci - an All-FCIAC selection last season and team captain - and Ryan Burress and defensive backs Colin Agosti, Nicko Rulio (co-captain and All-FCIAC West selection), Liam Waldron, Kyle Mazza and Jack Owens. “I’m hoping the team comes together as we progress through the season and keeps their focus and work rate moving forward,” O’Hara wrote. Last fall, the Mustangs pushed their way into the Class LL tournament by the slimmest of margins, making the field despite a 5-7-4 record - going 0-4-1 in its last five. Surprisingly, Warde, the No. 29 seed, upset No. 4 seed Newtown in the Class LL opener before losing 2-1 to Norwalk in the second round. This time, the Mustangs, and coach Justin Ottavio, do not want to just sneak in, they want to bang the door down. Lucas Montero, Cameron Millington, Jake Berecz and Mark Morataya all return and will be the cornerstones that Ottavio will use to keep the program going forward. Montero, Millington and Mark Morataya will be captains.